Adopted Mom & ChazztheDog wish to thank all the pals who entered our GiveAways this month March 2014. Without further ado —–> here come the WINNERS! Congratulations to each of you!!!! Book GiveAway Animal Cracker KIM S.
Movie Swag Mr. Peabody & Sherman MALLORY H. & LINDA S.
Product GiveAway ILEESH LINDA S.
The Dog Who Knows A Thousand Words LINDA S.
DISCLAIMER The ideas & opinions published here are those of Adopted Mom & ChazztheDog. We have not been influenced by any outside sources. SUMMARY: This is a fascinating story of the bonded working relationship between the professor and his Border Collie, Chaser: reportedly, one of the smartest breeds. At the time he was Professor at Wofford College of Spartanburg, South Carolina, John Pilley developed training methods and engaged some of his students to help in Chaser’s training. Often Chaser was a member of the class, having been brought to the lab by Prof. Pilley. OPINION: This is a highly interesting read. We found it motivating and inspirational regarding our personal training goals for ChazztheDog. We found it jaw dropping that this dog can find and identify 100’s of different dog toys in a huge pile of them, all jumbled together. The book also suggests that any Pet Pawrent can employ similar methods to teach their pet to learn multiple words and actions! 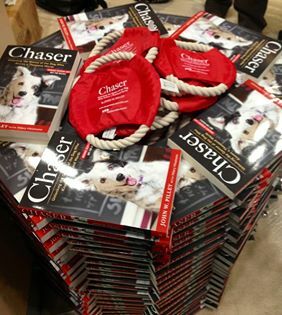 If you want to go beyond Sit/Stay/Heel and really communicate with your dog – read Chaser’s story. Participants must provide valid email address to be notified. Mandatory Entry: Leave a comment at the end of this post. List 5 -10 words or actions you have taught your dog to recognize. DISCLAIMER: The opinions expressed in this review are strictly our own. They have not been influenced by any outside sources. We received one copy of the book for review purposes and one copy to award in the GiveAway. We received no compensation for featuring this book at our blog. 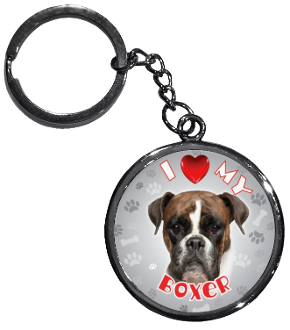 This site features breed specific items for Pet Pawrents: retractable leashes, shirts, key rings, mugs, tote bags, phone covers, mouse pads, etc. They offer a full guarantee and Free Shipping ! 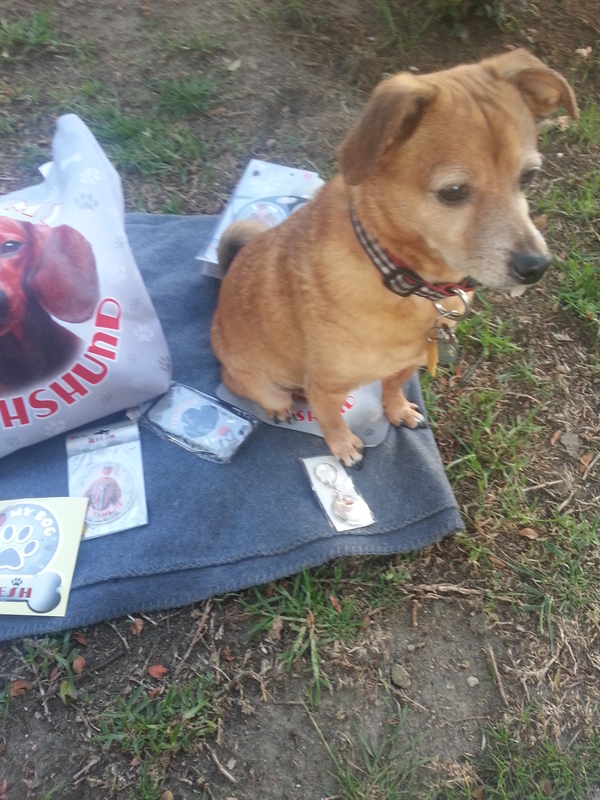 Even though Chazz the Dog is not a Dachsund he sure wanted to check out all the fun pawresents for Doxies!! 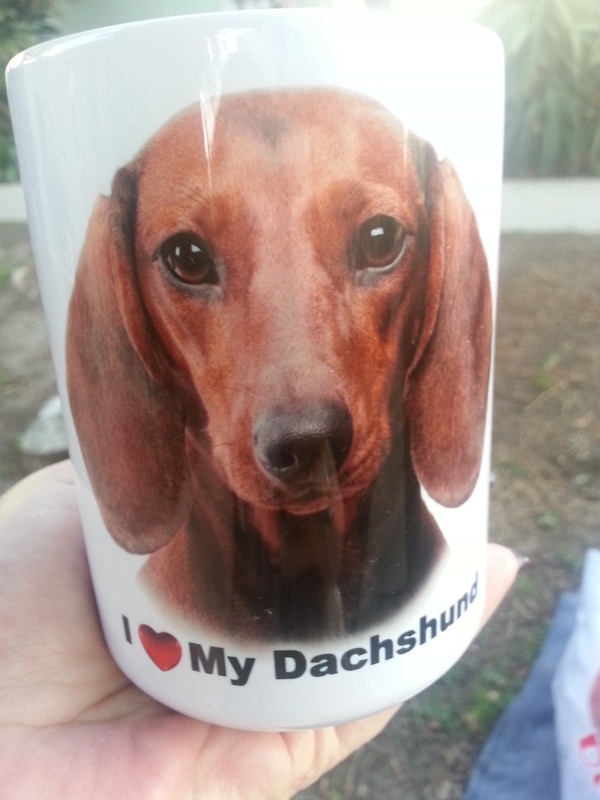 Leave a comment at the end of this post, what is special about your Dachsund furbaby? The opinions offered in this post are our own and not influenced by any outside sources. We received these items for the purpose of a Product Review & the GiveAway. We received no compensation for featuring ILEESH in this blog post. 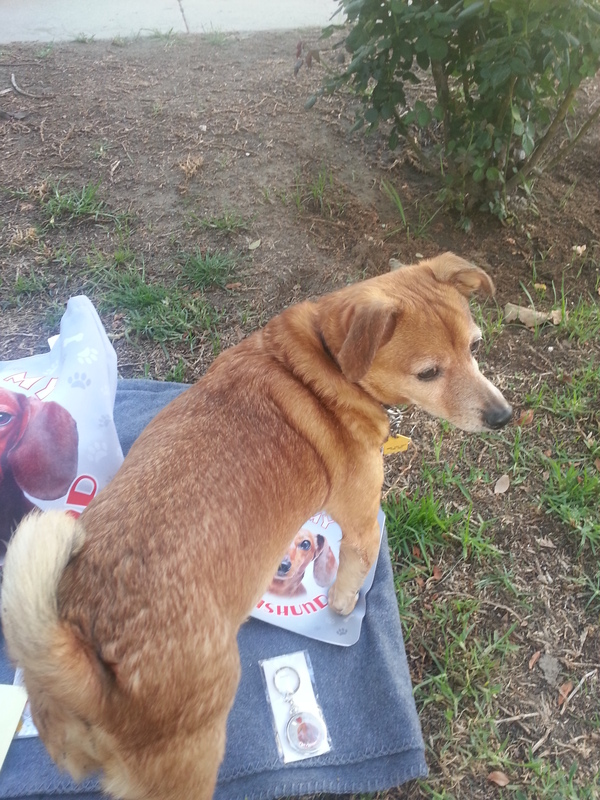 Chazz the Dog won his very own PETTER organizer/calendar/planner from another furriend’s blog. He loves it!!! Here he is…. Chazz spent some time in the front yard yesterday organizing his activities. Scheduling his appointments in his calendar/planner. Chazz is always less anxious when he knows the plans for the day! Check them out…here’s how to contact them. DISCLAIMER: The opinions expressed in this post are strictly our own and have not been influenced by any outside sources. 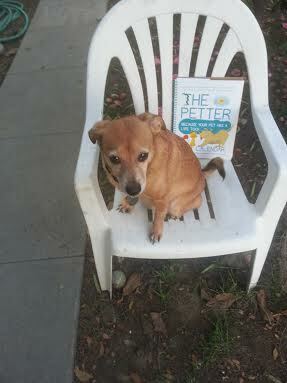 AdoptedMom blog received no compensation for featuring The Petter in this blog post. Ariel Winter takes a break from playing brainy Alex Dunphy on TV’s “Modern Family,” to voice Penny Peterson, in DreamWorks Animation’s new animated feature, “Mr. 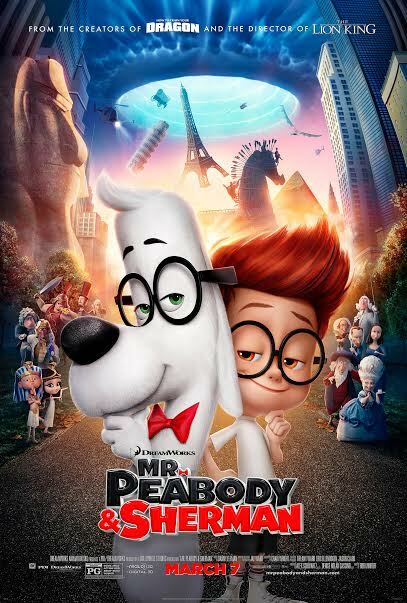 Peabody & Sherman.” The film has her and fellow actor, Max Charles, who voices Sherman, traveling back in time with the worlds smartest canine. The duo recently sat down for a quick Q&A session. For those who aren’t familiar with Mr. Peabody, the highly evolved and brilliant dog and his boy Sherman, they are characters that first appeared in the 1960s, when they were introduced as part of the cartoon series, “The Rocky and Bullwinkle Show.” Not surprisingly, neither of the two young stars had seen the cartoon prior to being cast. While Charles could look for inspiration in the classic cartoon for Sherman, Winter had a bigger challenge since Penny was not part of the original storyline. However, this didn’t seem to bother her, “It was basically like they handed me a book and it was empty and I got to write the pages,” she explains. “I thought it was pretty cool that I got to create my own character.” Winter also joked that she brought her own real life sass to the role. Adventure aside, the heart of the story lies in the relationships. First we have the friendship that develops between Penny and Sherman. Second, we see the challenges of the father and son relationship and the added complexities of a dog being a parent to a boy. As humanized as Mr. Peabody is, at the end of the day, he still is a dog. Clearly the message is about acceptance, and not just canine love. 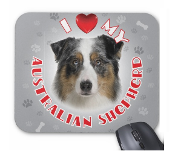 However, for those of us out there who love our dogs like part of the family, “Mr. Peabody & Sherman” is sure to hit a special chord in our hearts for the film’s depiction of the love, loyalty and companionship we share with our four-legged best friends. In addition to the voice talents of Max Charles and Ariel Winter, Mr. Peabody is voiced by Winter’s on screen, TV dad “Modern Family’s” Ty Burrell. Be sure to check out the film when it hits theaters nationwide. SUMMARY: The 1960's produced a popular cartoon show called, “The Rocky and Bullwinkle Show” Rocky was a flying squirrel, and Bullwinkle J. Moose was his pal. 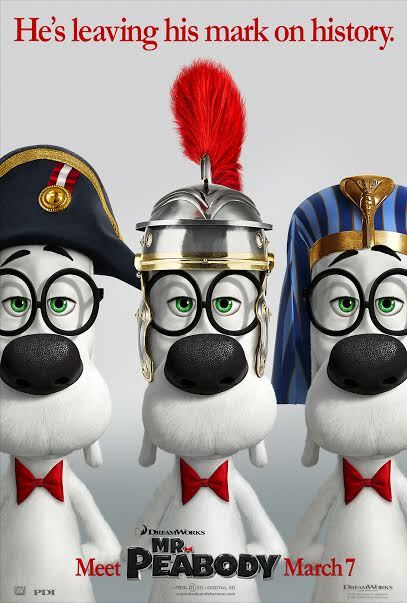 On the show was a feature cartoon starring Mr. Peabody & Sherman, Mr. Peabody was a highly intelligent white dog, who sported a jaunty red bowtie and a pair of round black spectacles. Sherman was 'his boy”. Mr. Peabody was almost like a Professor, he knew so many facts and interesting anecdotes. Together with Sherman they were both very inquisitive. When Mr. Peabody built his WABAC Machine he & Sherman traveled through time to many historical events and points of interest. This film traces some of those adventures! OPINION: This is a fun, lively,offering from the people at Pixar/DreamWorks. Fans of the original cartoon will enjoy this walk down memory lane - watching Mr. Peabody & Sherman and following along with their adventures. We recommend this film for dog lovers. 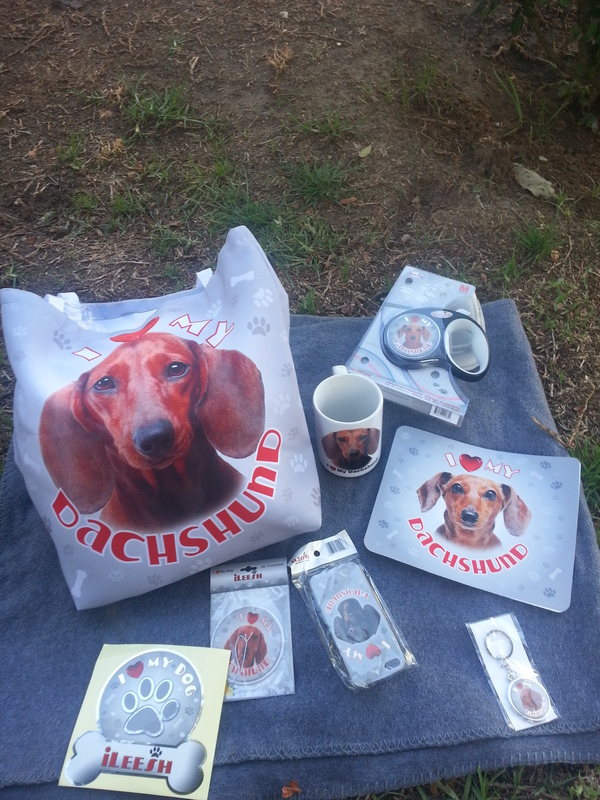 AMTCTD Blog is pleased to be able to bring our readers these pawsome prizes. Winners will be announced on this blog on March 24, 2014. Individual winners will be notified by providing a valid email address. Your security and privacy is important to us and you will never receive any spam email from this blog. That's a Pawmise! The opinions expressed in this review are our own and not influenced by any outside sources. The prizes for the GiveAway were provided to the blog for the purpose of entertaining our reader/ winners. Adopted Mom To Chazz The Dog Blog receives no compensation for reviewing this film in this space. * Certain portions of text in this post, the Q&A Interview with the actors doing the voiceover work specifically - have been provided for use by this Blog. New York Times and USA Today Best Selling Author of A Dog’s Purpose and A Dog’s Journey, brings you his latest work in the wonderful The Dogs of Christmas. “EVERY DOG STORY IS A LOVE STORY”…Bruce Cameron wrote those words not Adopted Mom, but we couldn’t agree more. Even those terrible stories we read about despicable animal abuse; ultimately become stories of love, rescue, and redemption…at least for the dogs and they are the most important part of the story in our opinion. The Dogs of Christmas features several different love stories central to the theme. There is the human story of characters Josh & Kerri, and the human/ canine bond of Josh and Lucy, the soulful-eyed pregnant pup that comes into their lives – capturing the kindness and natural empathy for a creature needing assistance. Almost immediately Josh realizes he has more then he can handle and contacts the local shelter where he meets the lovely and compassionate Kerri who comes to his aid. We really enjoyed this story! The writing is compelling, with characters we wanted to follow. Mr. Cameron is a proven author with skills and accolades to his credit. We definitely recommend this book for a great read. Hold on now, keep scrolling…it’s time for the big Book GiveAway…and by big we mean..3 WINNERS!!! Period: March 10 – March 23, 2014 Winner will be announced on the blog on 3.24.14 Winners will be notified by email. Invalid email address will disqualify entrant and another winner will be drawn. Leave a comment at the end of this post relating an anecdote you have concerning Dogs & Christmas (or Chanukah, or Kwanza for that matter). If you haven’t got a real one, make one up. Please provide your email address in your comment so we may contact the winners. We value privacy & security so your contact info will never be shared and you will not receive any spam from our blog. Also document in a comment if you follow or LIKE with other Social Media so you earn the extra entries available. GOOD LUCK to all participants. You have a very good chance of winning in our first ever Triple Winner Giveaway!!! Adopted Mom Blog received a copy of the book The Dog’s of Christmas for review purposes. 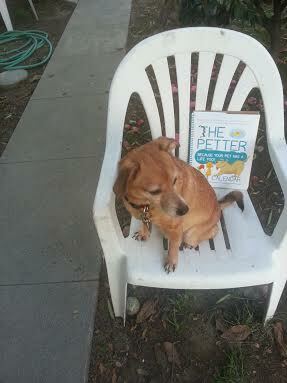 In addition, Mr. Cameron generously provided 3 copies to support a GiveAway for 3 lucky readers of our pet blog. Opinions expressed in this review are our own and not influenced by any outside source. We receive no financial compensation from featuring this book at our blog. Animal Cracker/em> by Andi Brown is a humorous take on what goes on behind the scenes of a fictional organization, Animal Protection Organization-12 site pet shelter group. The main character, Diane Salvi, the new APO Communications Director and her troublesome relationship exchanges with her arrogant, devious, cheating boss – Hal – her on again off again social life, and mainly her passion for all animals. There is a dysfunction that runs through the home office of the APO organization that borders on the absurd! Author Andi Brown generously provided Adopted Mom blog with another copy of her book for 1 Lucky Reader. Mandatory Entry: Please leave a comment on this post stating why you wish to win this book. DISCLAIMER: Adopted Mom Blog received one copy of this book for purposes of review. The opinions expressed are our own and have not been influenced by any outside sources. We also have one additional copy for the GiveAway courtesy of author Andi Brown. Chazz the Dog absolutely devoured these treats. He likes chicken in general.. so add to that the smoked flavor..that put them over the top!!! You get 2 vacuum sealed pouches that we refridgerated after opening. I really rationed these pieces out to him or he would have gobbled up an entire pouch in one sitting – seriously. We are not vets or nutritionists. Based on the ingredient list and Chazz’s reaction to this product we think these are a good choice. Informed pet pawrents read, do the research, and decide what’s right for your pet ……..each and every time. DISCLAIMER: We received a box of these treats for review. The opinion(s) expressed are our own and not influenced by any outside sources. We received no other compensation for featuring Indigo Smokehouse Strips in a Product Review at our blog. We regularly review canine pet products, books, and films. 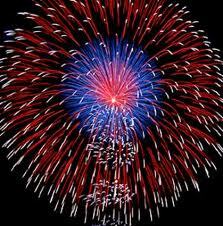 Check out Chazz’s Literary Corner Page for book reviews / films. AdoptedMomToChazzTheDog blog has joined with a group of bloggers in a campaign on behalf of Zukes. AMTCTD is publishing a post featuring Zukes products, their corporate values, and their passion to bring a healthy approach to both how you feed and interact with your pet. For those of you not familiar, Zukes is a US company, located in Durango, Colorado that produces and distributes healthy, natural/organic treats and snacks for your dog or cat with – US sourced ingredients of the highest grade. In addition, they have made a commitment to an eco-green environment at their headquarter facility. Zukes offers a large product line with treats that will please your picky or not so picky eater. Chazz the Dog is a medium sized 22lb. Terrier/Shibu Ina mixed breed. He doesn’t particularly like hard crunchy treats. Long before this post, we tried Zukes Mini Training Treats. These are some of his favorites. We had mainly used Roasted Chicken flavor. Now Chazz has been enjoying other flavors like Duck, Rabbit, Peanut Butter, etc. He also picked out the Chicken/ Beef flavored Z-Fillets. They tear easily into small bite size pieces and they are yummy. Most of Zukes treats are smaller sized and very convenient to carry in a treat pouch and use for training. An ingredient list for each type and flavor of treat/snack is available at the Zukes.com website. DISCLAIMER: Adopted Mom to ChazzTheDog Blog has received no compensation for this review. We did receive a box of various treats to use for this review. Our opinions are our own and were not influenced by any other persons. Greetings Gang Are you still reading us? Hi efurrybuddy it’s AdoptedMom &ChazztheDog after a long break. We want to explain that Mom had some health problems and didnt feel up to posting. But we reslly missed you all and want toreconnect. Hope you are still out there and will welcome us back. We are going to follow up with a Product Review for ProSense line of dog health products. So stay tuned for that!! Possible GiveAway to Enter & Win!! !